In bizarre news, this group of 50 friends hosted a "funeral" complete with coffin, funeral car and vicar for their friend...who is still very much alive. When Keiran Cable met his girlfriend a few months back, his social life took a hit after unintentionally ditching his friends. So, Cable's neglected friends thought of a clever way to really get his attention — a "surprise funeral" for the 20-year-old. The group, who play on the same football team together, said it was nearly impossible to keep this a secret...but they're glad they did. When Cable showed up for what he thought was an average night at the pub, he was absolutely shocked to find 50 of his friends dressed up for his "funeral." Now we're wondering what his girlfriend thinks about all this! 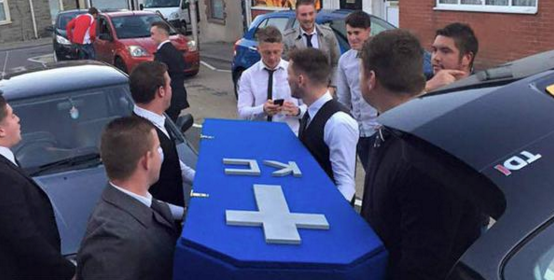 This girl from China faked her own funeral to "enjoy life:"